Manila—(PHStocks)—Philippine stocks recovered Thursday, 1 August, lifted by indications that the US Federal Reserve will continue its monthly bond buying program. 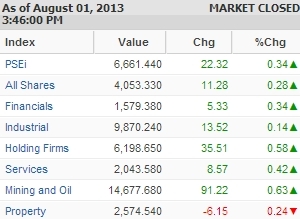 The mainboard Philippine Stock Exchange (PSE) index increased by 0.28% to 6,661.44. Except for the Property sector (-0.24%), all counters were up, led by the Mining and Oil index, which increased by 0.63%, followed by the Holding Firms segment, which gained 0.58%. The wider All Shares index slightly went up by 0.28%. Trading was slightly moderate. Value turnover reached PhP5.37 billion on 684.88 million shares traded. There were 79 gainers against 59 losers, while 38 stocks were flat. Today’s most active stocks in terms of volume are Ayala Corp. (AC, PhP603.50, NC), BDO Unibank Inc. (BDO, PhP81.65, +0.8%), Metropolitan Bank & Trust Company (MBT, PhP105.80, -0.38%), Megaworld Corporation (MEG, PhP3.25, +0.31%), Alliance Global Group Inc. (AGI, PhP27.30, +4%), Manila Electric Company (MER, PhP287.00, +0.14%), Puregold Price Club Inc. (PGOLD, PhP41.30, +0.85%), SM Prime Holdings Inc. (SMPH, PhP17.60, +0.11%), Philippine Long Distance Telephone Co. (TEL, PhP3,038.00, +0.6%), and Metro Pacific Investments Corporation (MPI, PhP5.29, -2.04%).